Vivica Fox seen out at The Polar Lounge in NYC, she looks great, I guess she made the extra weight work for her. Eve seen out at a cancer benefit in NYC, I'm not sure what to make of this outfit, it's just a whole lot going on. 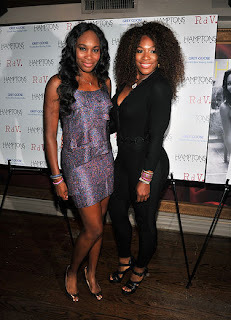 The Williams Sisters were out in full force yesterday, they look great, I like that cat suit Serena has on makes her look like one of those chics from a 70's movie. Ciara in NYC leaving her hotel, it's funny that just a few months ago she was moving into an apartment with Amare Stoudemire, who dumped her shortly before the ESPY Awards for his baby mamma. Keep your head up Ci Ci, a good guy is out there for you.